Update January 14, 2014: The game's website is now dead, but the game is not. Stacy Davidson clarified that he killed the website because he'd rather have the game fly under the radar by developing it quietly and then releasing it when it's done, in order to avoid the legal department of Disney. The new link to the demo can be found at this thread on his game development company's forums. D'oh! I posted this on Mixnmojo, but forgot to post about this here. With all of the hullabaloo about LucasArts recently, now is as good a time to post about this as any (although it's unclear what the fate of this game will be now that LucasArts is owned by Disney, which likes to keep its intellectual property on a tight leash). 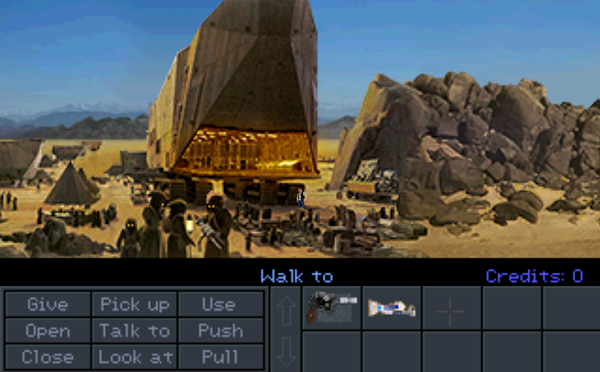 This summer, Han Solo Adventures, the Star Wars fan game that is being created to emulate the style of LucasArts adventure games (in particular Indiana Jones and the Fate of Atlantis), received its first playable demo. It's a short three room demo made with Adventure Game Studio that contains many references to the Star Wars films and LucasArts adventure games.